3.3 What Should You Consider when Using a Massager for Plantar Fasciitis? 5 What Are Foot Massages Good For? Using foot massagers is a good way to relax after spending a long day at work. 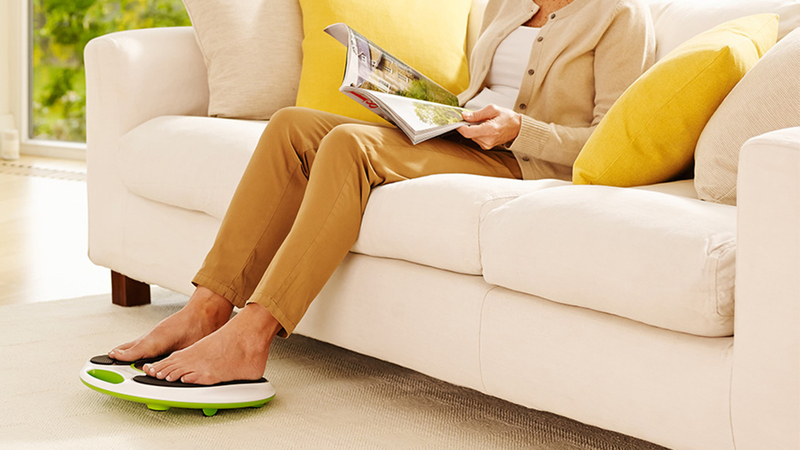 But did you know that constantly using a foot massager can offer multiple health benefits? In the first part of the following article, we present the best foot massagers of 2019. In the second part of the article, we explain how each feature of the foot massager will influence your experience, and how to find the right model for your needs. We’re certain that after reading the foot massager reviews and the comprehensive buying guide we prepared, you’ll have no problems making an informed decision on which is the best model for you. The MedMassager is one of the most powerful foot massagers currently available on the market. This model comes with 11 different intensity levels, and it can produce up to 3,700 rpm. One of the advantages of using this foot massager is that it has a durable and sturdy construction. This will allow you to use the foot massager for a very long time. Another advantage is the unit’s design. Even though the MedMassager seems like a regular foot massager, you can actually tilt it and use it to massage your ankles and calves. Overall, this is one of the most powerful models currently available, and it’s a good buy. The QUINEAR foot massager with heat is an effective unit that comes with a small and compact design. Even though this is a small unit, it’s still capable of accommodating most users, and it will fit anyone who has up to size 10 feet. A good thing about this model is that it uses 6 different intensity settings to massage your feet. This will allow you to select a different intensity setting depending on your moods and needs. Another good thing is that it has a low maintenance. The unit’s covers can be removed and washed, and you can clean the outer shell with ease. All in all, this is an effective unit that will provide comfortable foot massages. 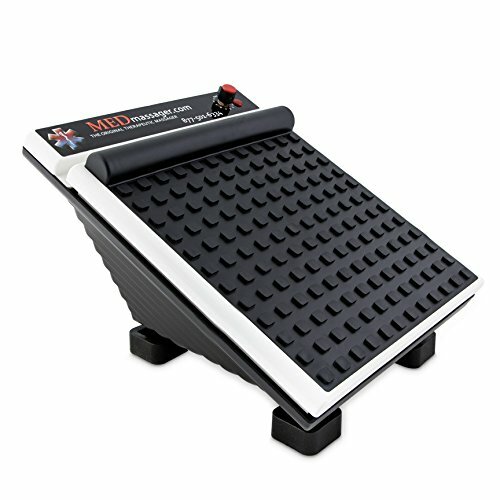 The Belmint foot massager is one of the most popular models you can buy today, and it’s easy to see why. This unit uses 5 different massage intensities to work and relax the muscles in your feet, and it has a user-friendly control panel. 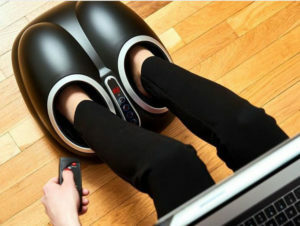 Even though the foot massager has a compact design, it’s still able to accommodate most users. 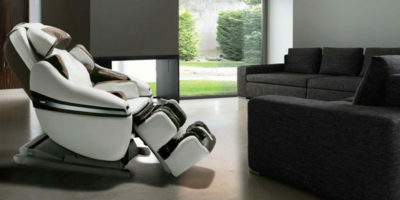 This model can accommodate anyone who wears up to size 12 shoes, and it will provide a comfortable massage experience. The bottom line is, this is a very popular and efficient model that’s well worth its price. The Miko foot massager is one of the highest rated models currently available on the market. This model comes with a small and compact design that makes it both portable and easy to store. A good thing about this model is that it uses a user-friendly control panel that will allow you to change its features and track the changes you make with ease. Another good thing is that the unit comes with remote controls. This is good especially for those who have problems bending over, such as the elderly and those who suffer from chronic diseases. Overall, this is a very effective model that provides a good value for your money. 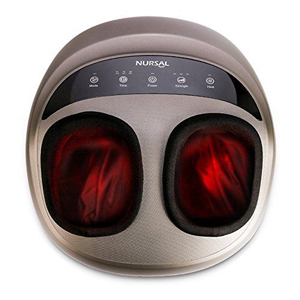 The NURSAL foot massager is a good model that comes at a decent price. 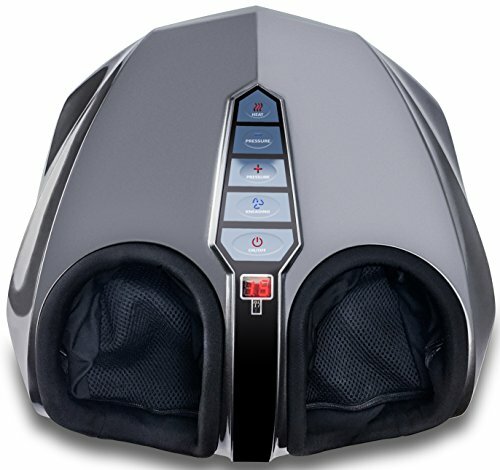 This small and compact foot massager uses airbags and a kneading massage technique to relieve your muscles and provide a relaxing massage experience. One of the advantages of using this model is that it’s small and portable, allowing you to move it with ease. This can also be an advantage if you plan on using a foot massager while you’re at work. Overall, this is a good massager that provides a comfortable massage experience and it’s well worth its price. 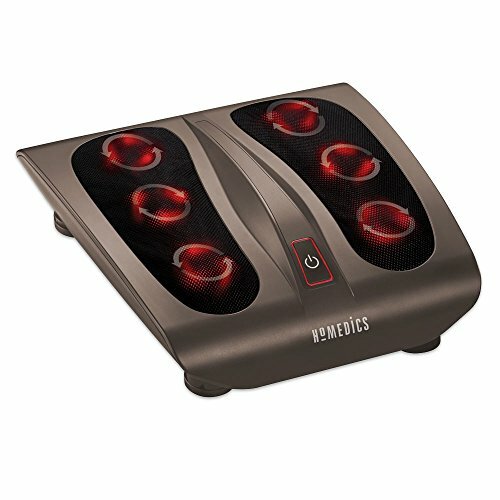 The Homedics FMS-270H is an interesting foot massager that has a minimalist design. This unit is low and wide, and it’s very stable during the massage session. This will allow you to use the massager on shiny floor surfaces without worrying it will slip or slide. An advantage of using this model is that it comes with 18 massage nodes that will work the muscles in the soles of your feet. Not only will this provide a comfortable massage experience, but it will also improve your blood circulation. This is a very good model that comes with toe controls and provides a thorough foot massage. 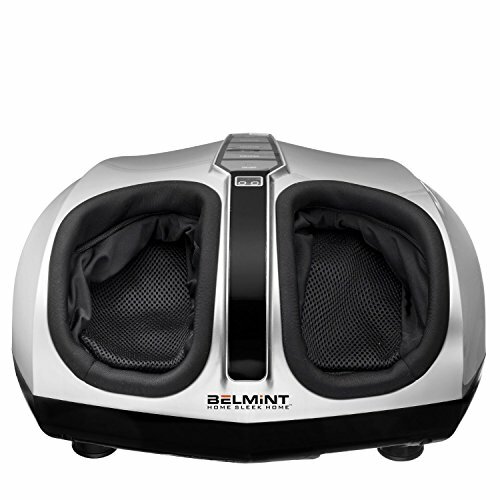 The Belmint foot massager has a low minimalist design that makes it very easy to store. The unit’s adjustable height will allow you to keep your legs comfortable wherever you sit, and it will allow you to change the massager’s inclination if you want to. A good thing about this model is that it provides a thorough massage experience. 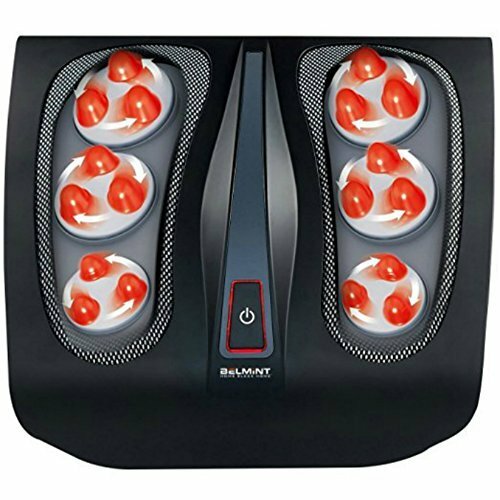 The foot massager uses 9 massage nodes for each of your feet, and it will also produce comforting warmth that spreads across them. All in all, this is a good foot massager that offers a nice value. The Nekteck foot massager is an effective unit that comes at a cheap price. Even though this unit doesn’t cost too much, it’s still capable of producing a very comfortable massage. An advantage of using this foot massager is that it uses 18 massage nodes to work the knots in your muscles and relax them. The 3 massage heads this model uses for each of your feet move independently, and they will provide a good massage experience. Overall, this model is efficient and cheap, providing a good value for your investment. Every foot massager comes with different features that help it massage your feet. Even though they might look alike, two-foot massagers can provide different massage experiences, depending on the features they use. Plantar fasciitis is a common condition, causing pain and discomfort in the heel area. While it is true that middle-aged people are more likely to experience it, young people might also suffer from plantar fasciitis. In essence, the pain is triggered by the inflammation in the ligament that connects the base of the toes with the heel bone – namely the plantar fascia. It is essential to learn more about this condition so that you can diminish the severity of the symptoms. Truth be told, if you don’t address the problem, the pain will become worse by the day. First, it’s worth pointing out that plantar fasciitis is a common condition for runners, in particular. It is critical to provide your feet with sufficient time to recover after training. At the same time, if you are already dealing with this condition, it is just as important to give your feet the rest they need. In addition to that, another critical element is choosing the right footwear. This is the one that facilitates sufficient heel and arch support while being shock absorbent. Aside from that, footwear should present the right amount of cushioning. This will essentially prevent the aggravation of the condition – which should be your priority. There is another thing you could do in order to treat plantar fasciitis – namely consider massage therapy. For thousands of years, foot massage has been a popular and efficient way of treating various conditions. Not only that massage therapy is helpful for rejuvenating the feet and the legs, but it also alleviates the pain while promoting relaxation. 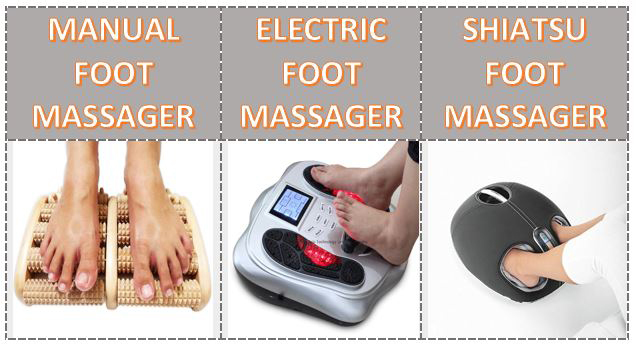 There are specially designated foot massagers that do all this and more. Plantar fasciitis can be a frustrating condition. But a foot massager is a convenient and efficient way of dealing with it, not to mention that it is an all-natural way of getting plantar-fasciitis pain relief. With that in mind, you don’t have to fret about the potential side effects, as it is the case with most countertop medications. That being said, we’d like to outline the reasons why a foot massager can help those suffering from plantar fasciitis. We could say that this is one of the most evident benefits. You should note that the circulatory system aims at regulating and distributing the blood cells throughout the entire body. At the same time, it redirects potentially harmful cells to specific parts of the body, for removal. In the lower part of the body – in the proximity of the feet, in particular – the blood flow is lower in comparison with the upper part. This could be partly attributed to the significant distance to the heart. This is why massaging the feet will optimize the circulation in the lower extremity of the body. Not only that this can really make a difference for people suffering from plantar fasciitis, but also for people suffering from diabetes, and the list could go on. There has actually been a study that showcases the efficacy of massage therapy when coping with plantar fasciitis. Expressly, the people that combined massage therapy with stretching experienced unexpectedly positive results altogether. This is the second most notable benefit. This condition can be quite nerve-wracking, as it causes a significant level of discomfort. This is where a massager comes in, as it promotes relaxation, thus enhancing your overall state of wellbeing. In other words, a foot massager can notably improve your body’s homeostasis. Homeostasis takes place when the entire body works in unity. This facilitates a feeling of relaxation and overall wellbeing, which imminently diminishes negative feelings such as anxiety, frustration, so on and so forth. If you’ve had an injury and you’re recovering, this means that you are also dealing with common side effects such as joint pain, muscle soreness, so on and so forth. Massaging can seriously help in this respect, as well. As a matter of fact, when you combine foot massage with appropriate foot strengthening exercises, the road to recovery is obviously speeded up. Not to mention that this strengthens the feet, possibly preventing other similar incidents from taking place in the near future. What Should You Consider when Using a Massager for Plantar Fasciitis? If you’re thinking of getting a massager for treating this condition, then there are some things you should factor in. For one thing, plantar fasciitis targets the heel and arch of the feet. This is why you should direct your attention towards a device that focuses on these areas. There is a wide range of products on the market, some targeting the entire foot – but such a unit isn’t of any help, as you need something that focuses on the target area. The intensity of the unit is another factor worthy of your attention. To that end, you don’t want to get something that is too intense or, on the opposite side, fails to address your problem altogether. If your feet are overly sensitive or you’re also suffering from arthritis, you should choose a unit whose operation isn’t too harsh. Plantar fasciitis is a type of injury that tends to be repetitive, targeting hikers, runners, but not necessarily. It is essential to differentiate between plantar fasciitis and heel spurs or flat feet – while there might be some similitudes, they are still different. The good news is that you can treat this condition by respecting a few general ground rules. For one thing, you should allow your feet to rest, make sure you’re wearing the right shoes (look more into this if you aren’t certain what this entails), and give massage therapy a go. Of course, there are also more severe cases of plantar fasciitis: in this scenario, it is best to address your concerns to a certified professional, as opposed to leaving things to chance. In some isolated situations, plantar fasciitis can be quite a stubborn condition, so don’t underestimate it. What Are Foot Massages Good For? You might be wondering what foot massagers are good for. Well, in the following section we explain when specialists recommend using such a machine. One of the first things you’ll notice after using a foot massager is how relaxed your muscles feel. Most of us nowadays spend a lot of time sitting or standing. Neither of these scenarios is good for our feet. When we spend a lot of time sitting, our blood circulation is somewhat slow to reach our feet, so our feet might seem cold all the time. On the other hand, standing and walking a lot can lead to swollen or sore feet. Using a foot massager will work the muscles in your feet, and it has a relaxing effect. Poor blood circulation in the feet can be determined by many conditions that can be the result of your life choices or different health conditions. People who spend a lot of time sitting usually experience a poor blood circulation because they don’t move around as much as they should. However, even people who are active can experience a poor foot circulation from time to time. Using a foot massager will stimulate your foot blood circulation, and it will make your feet warmer. Here’s how they do it. When the massager works the muscles in your feet, the muscles warm up much as they would when you engage in a physical activity. Thanks to the muscle activation, more blood reaches your muscles. The increased blood flow will bring more oxygen and nutrients to your feet muscles, so it will help them stay warm in the long run. 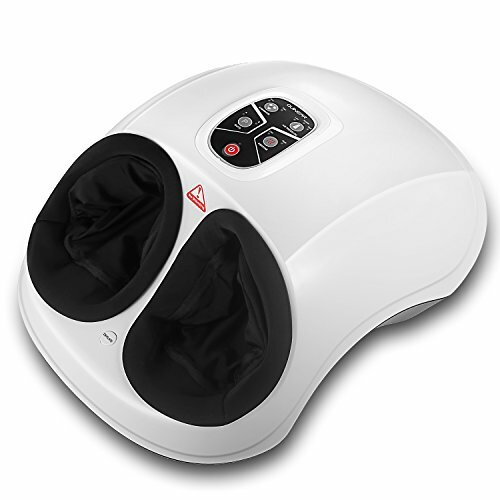 The effects of a foot massage can be enhanced by using the heated massage feature. Not only will this feature warm up your feet, but it will also make your blood vessels dilate, allowing more blood to reach them at once. People who suffer from chronic diseases such as diabetes can develop neuropathy over time. Foot massagers counter these symptoms by stimulating the nerves in the soles of your feet, reducing nerve pain and easing your aches. This nerve stimulation can eliminate the numbness and tightness you might feel if you suffer from neuropathy. Plantar fasciitis is a common foot condition when the tissue on the bottom of one or both feet becomes inflamed. People who suffer from plantar fasciitis need to treat it because they risk changing their posture and walking position otherwise. Luckily, you can use a foot massager to treat this condition in the comfort of your own home. If the plantar fasciitis determined pains or aches in the sides or arches of your feet, you should find a massager model that’s capable of targeting those areas as well. As you most likely know, the soles of your feet are covered in pressure points that can have different effects. These pressure points are used in reflexology to relieve pain and promote relaxation. If you want to experience the full benefits these pressure points can offer, you should look for a model that provides a thorough kneading or shiatsu massage. Targeting the pressure points close to your toes can alleviate your headaches and reduce their frequency. People who run over long distances and those who just start running are prone to experience running aches. Depending on the quality of your running equipment and your muscles’ status, you might experience running aches sooner or later. A foot massager can eliminate the tightness in your muscles and have a relaxing effect. Some people might experience muscle tightness in their calves as well as their feet after running. Luckily, some foot massager models can target those muscles as well. Arthritis represents the inflammation of the joints. Arthritis can either be chronic or acute, and it can lead to swollen feet and fluid retention in your limbs. Using a foot massager can alleviate the symptoms of arthritis. If you suffer from this condition and you’re looking for a foot massager, you should look for a model that comes with a heated massage feature and it’s capable of providing a thorough kneading massage. Using both of these features will improve your arthritis and reduce your pain. People suffering from bunions experience a constant pain in their feet. Because of hereditary or non-hereditary conditions, their big toes are pulled in towards their other toes, and that can be very unpleasant. Foot massagers can relax the muscles in the soles and sides of your feet, and they can improve this condition. If you’re suffering from bunions and you’re looking for a foot massager, look for a model that can massage both the soles and sides of your feet and that’s capable of providing a shiatsu massage. People suffering from lower back pain can benefit from foot massages. Sometimes the lower back pain is caused by a poor posture. The poor posture can be determined by pains and aches in your legs and feet. Using a foot massager can relieve the pain in your feet and legs, improving your posture. This can lead to a better posture and less frequent pain in your lower back. Certain pressure points in the soles of your feet can relieve menstrual pain. Based on reflexology principles, you can use a foot massager to reduce or relieve menstrual pain. If you’re looking for a foot massager that can deal with menstruation pain, make sure you look for a model that can target your calves as well as the soles of your feet. Based on the principles of reflexology, you can use foot massage to induce labor. To do this, you will need a foot massager that’s capable of massaging the soles and sides of your feet. Besides these points, the massager should also work on your ankles and calves to make sure you target as many acupressure points as possible. However, you should always discuss with your physician before attempting to use a foot massage to induce labor. Also, Check out the best online selection of the massage oils and neck and shoulder massager reviews from a wide range of brands! As you could see in our short foot massager reviews, every model uses different features to provide a great massage experience. Not all the units we included on our list work in the same way, but all of them are very effective. Keep in mind that the best foot massagers not only provide a relaxing experience, they also offer a lot of health benefits. To find the right model, you should think about how you’re going to use the massager most frequently, and what you’re planning on using it for. Depending on the answer to these questions, you should either look for an open design model or a closed one and decide on which model offers the most helpful features for your needs.